After Anne finished Peter’s socks, she made a pair for me. I was equally delighted and immediately put them to work. And that’s when the abuse started. I really should have taken a before photo, because Anne’s work is copybook perfect, and they were a work of art. Before. But then, I put them into my whacking great hiking boots every other day—well sometimes every day—and walked all over the farm in them, pretty much from the 7 am run with the dogs to the 5 pm run with the dogs and all the stockwork and shepherding in between. They got washed almost every other day, spun in the washing machine and slung over the bar at the top of my four poster bed to dry (no drying flat around my house). First, they felted a bit—I was ok with that, it made them a bit more cushiony. Then they shrank a bit—I was ok with that, too, because they’d stretch out again as I wore them. Then, after about 3 months of this abuse, the first holes appeared—I was even ok with that. I can darn (not well, but enough to get by). And then the darns needed darns, and knowing how much work goes into hand-knitting socks, I wasn’t willing to give them up. Anne has made me three more pairs and they’ve all gone the same way. Meanwhile, I became so spoiled by the softness and absence of elastic that I took all of my old commercial socks to the Salvation Army bin. Now I’m stuck, darning the darns and trying to be kinder to my remaining bits of sock. So, I finally decided I had to lift my ban on synthetics and order a spin of reinforced sock yarn from Design Spun. The issue of felting/shrinking is another aspect of this. When I first started getting yarn made, I looked into the superwash commercial non-felting treatment, and was pretty much horrified at the process—chlorine is used to strip the scales off of the fibres so that they can’t ratchet up against each other. What I didn’t realise at the time, but came out in my conversations with Peter Chatterton (aka Chatty) at Design Spun is that virtually all the superwash capability is now in China, so good-by to any traceability. Worse yet, there is a final step in the process in which every little fibre is coated with a polymer to make the fibres even slipperier. Doesn’t seem like you could call it wool any more, does it? As an alternative, Chatty and his team have come up with a post-treatment that can be applied after dyeing, and that is permanent. You can then machine wash the garment on lukewarm wool or delicate cycle. It’s not the fully machine washable version that superwash gets you, but is much preferable from a fibre and environment perspective. The post-treatment is a silicone-based compound that is applied at 50 deg C, then allowed to dry on the yarn, creating the permanent effect. The treatment produces acetic acid (vinegar) as a waste stream—much less environmental impact than chlorine. However, it still coats the fibre, and there are end-of-product-life recycling consequences with silicone. I’m not entirely sure this is the way I want to go, so I’m doing an experiment (there’s a surprise) and hedging my bets. Socks, I’ve learned, can be little works of art. In this pair, the yarn was gradient dyed by Agnes Bolton (Colour By Me/tres/) for her daughter. In the next spin, happening this month, Design Spun will make me 200 kg of reinforced (80/20 wool/nylon) sock yarn. Half of that will remain untreated (and undyed) for the indie dyers to play with. The other half will be dyed and post-treated for me to sell either to shops or online. There will only be 2 colours of the post-treated yarn—Storm and Hawthorn. That’s because I have to have a minimum of 50 kg per colour. In theory, the indie dyers can use the same post-treatment, and they may choose to. It’ll be interesting to see what we all think about the different options after playing with it and doing our level best to wear it out over the next few months. 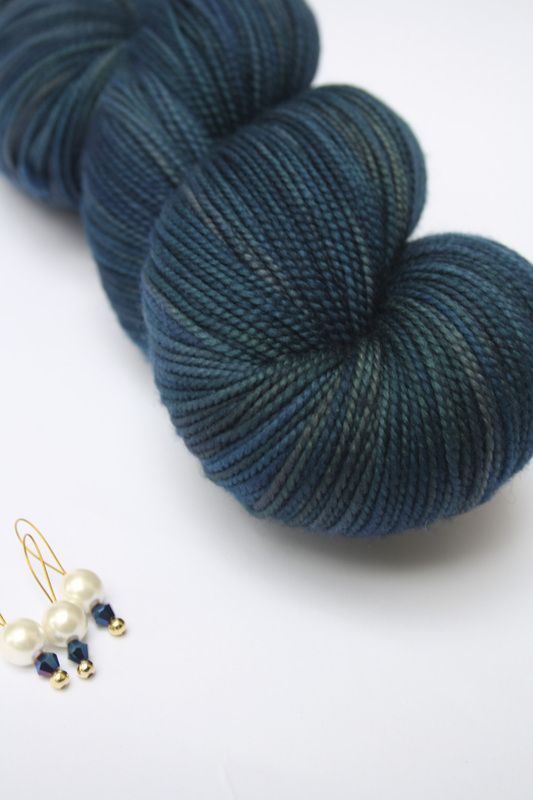 I wouldn’t go so far as to say sock knitters are obsessed, exactly, but there are sock yarn clubs out there, like this one from Augustbird (Rebecca Robinson)–Downton Abbey. You sign up and get, for instance, a skein a month for 3 months. And if you don’t sign up, tough luck. …or like this one–Anne from Rebecca’s Persuasion sock club. I tried to acquire this one, not knowing about the club thing. There is one skein of this left in someone’s Ravelry stash, but it is NOT for sale. I’m guessing I’ll lean toward untreated in future, mostly because the last pair that Anne made me, which she made ridiculously too long, have felted and shrunk to a lovely, cushiony, just-right size. Now complete with holes. 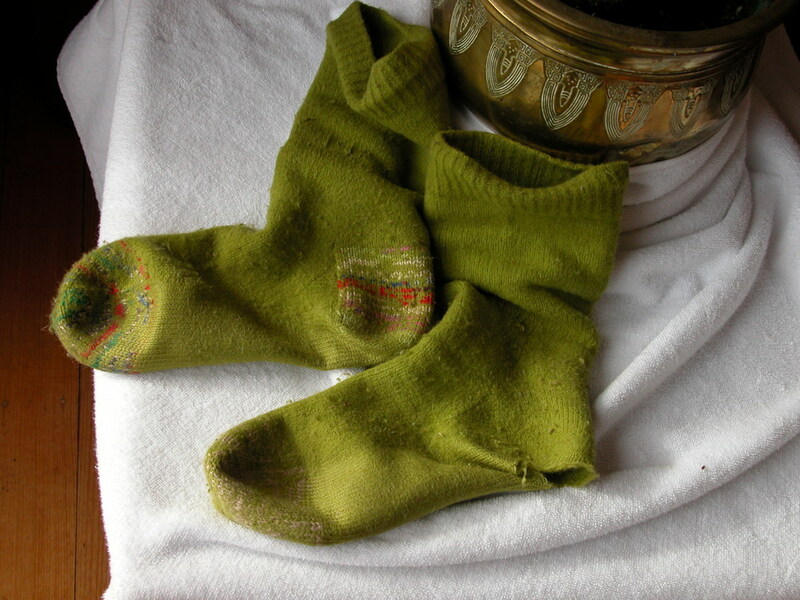 Thinking over what I've written, I realised that all this darning has given me a feeling of connection with the millions of women who, over the centuries, have knitted socks for the people they love, and been aghast at how quickly they wore out and had to be darned or replaced. It's a lovely tradition of caring and creativity. Sort of like love made tangible.